Over the past three years in our program, I’ve had many opportunities to converse with interested folks about the wonders of plants. Plants do some pretty miraculous things, no doubt. At the very core of their existence, they are required to survive ‘in place’. How many other living organisms on Earth can claim this feat? Very, very few things can accumulate life’s requirements (reproduction and resource acquisition), without movement. Not to mention, plants also must adapt to local conditions: contamination, weather, drought/flooding events, and more. While animals, insects, and birds can move when their environment gets unfavorable, plants must shelter in place and utilize strategies that they’ve evolved over the millennia of time they’ve been on this planet. admire this plant?! It eats meat, but cannot move from place because it lacks musculature and because it needs to stay rooted in the ground to obtain water, minerals, and necessary stability to stay erect. Many are surprised to learn that this insectivore is native to our own United States, found chiefly in wetlands of the Carolinas. Let’s discuss the biology of the Venus flytrap, and then talk about its inspiration for design applications. The Venus Fly Trap lives in nutrient-poor wetland soils, particularly low in nitrogen and phosphorus. Plants require these elements and all plants have strategies that allow them to acquire them from their environments—sometimes in very unique ways! Remember, though, that plants can’t move. They rely on things that are accessibly near them. Soil and the atmosphere being the mediums for most plants, cannot be relied on by the Venus flytrap. This constraint doesn’t faze it! Other organisms come to plants, right? Aphids, pollinators, nectarivores, and other critters visit plants for meals of all cuisines (vegetation and nectar), and this carnivorous plant evolved to capture the nutrients and energy from these insects to ensure its survival throughout time! (The first written documentation of the Venus Fly Trap was noted in 1760 in North Carolina, by North Carolina Colonial Governor Arthur Dobbs ). A question I am frequently asked is whether the plant does photosynthesis. Yes, the Venus flytrap does have the same anatomy and physiology required to be in the Kingdom Plantae. It is not uncommon to hear that they rely solely on insects for nutrients, but this is not true. Insects are merely the back-up mechanism for the minerals that a play would obtain from the soil, not the CO2 or sunlight energy obtained above ground. 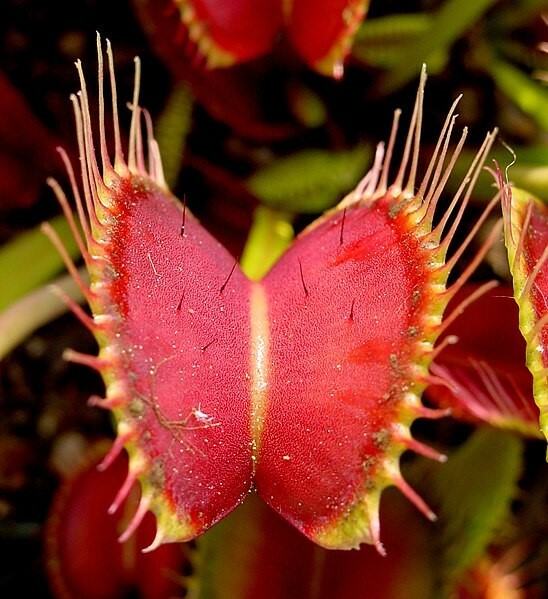 We get it, the Venus flytrap eats insects for nutrients… but how? (Video: 4-minute YouTube video of Venus flytrap in action). When a larger-sized insect (flies, ants, spiders, grasshoppers, i.e. ), lands on the inside of the leaf blade, the weight of it will eventually trigger minute hairs. These trigger hairs will respond (0.1 second response time), by closing the trap. Ideally, the prey will be inside, but, as you can see in the suggested video, this mechanism is not fail-safe. As is in nature and life, sometimes we lose the game. Notice the trigger hairs on the inside of the leaf blades. Photo by Noah Elhardt. The response of the trigger hairs is an example of a nastic movement and thigmotropism. Thigmotropism is the act of responding to the direct stimulus of touch, such as a fly landing on the inner leaf blade and bumping into one of the two or three trigger hairs. Nastic movements are controlled by hormones, more so than by a direct stimulus. Once the direct stimulus causes the thigmotrophic response, auxin (a plant hormone) stimulates cell expansion as a rapid growth response. In short, the cells inside the leaf of the Venus flytrap are told to swell up quickly, which causes the leaf blades to close. This is the same physiological response and movement that is witnessed when a flower of an angiosperm plant opens and closes in response to light! (As an aside, auxin does some pretty rad things in plants that I encourage you all to read about in your down time!). How could we not be inspired by this amazing plant?! I’ve talked in previous posts about some possible applications for designs based on the mechanisms of the Venus flytrap: baby gates, pet gates, sensors for factories, sensors for home safety, etc. I won’t rehash that conversation. The general idea involved here is the passive sensing with quick response that uses only clean energy. While the response mechanism is certainly worthy of investigating, I would add in the importance of Life’s Principles as an additional means of bio-inspiration from the Venus flytrap. If we consider the rationale involved in utilizing insects for survival, we witness the ability of this natural organism to obtain its needs from the local environment in absence of the preferred mechanism for sequestration. As far as I know, the Venus flytrap isn’t shipping in her flies and spiders from the west coast. She has found a way to survive and thrive with what is near to and available to her. She is substituting a necessary product for another locally obtained product. She carefully considered her choices and chose to adapt and evolve, rather than die. Of course I am getting a bit anthropomorphic here, but my goal is to encourage companies to look at the bigger picture of what is important to the planet, to its business, and to its customers. The amount of money and natural resources that are invested in product development could, perhaps, be re-evaluated to better meet the needs of the business by responsibly utilizing local supplies, rather than shipping them into the area. The re-evaluation might discover that the location of the business itself is better suited to be near the customers it most services—avoiding the strain of shipping far distances. As I leave you, to spend more time preparing for my upcoming comprehensive exams, I would like to mention this quote I read in Botany for Gardeners (Capon, 1990). The preface of the quote describes the means by which antifreeze was developed, inspired by ‘leaf antifreeze’ (increasing the concentration of sugars in the protoplasm to lower the freezing point inside the cells). “Plants have been ahead of human invention by several million years.” Consider this as coming from a 1990’s book for gardeners, not for engineers, designers, or biomimicry-enthusiasts. This is written by someone who just appreciates plants for the value they bring to all of us in such a variety of ways. I encourage all of you to continue to read about the wonders of plants and be inspired by all the great things they do… all without leaving home! The tiny section of the world that houses Venus flytrap. Capon, Brian. (1990). Botany for Gardeners: An Introduction and Guide. Portland, OR: Timber Press. pp. 86.